>After doing my 2011 “Year End List” last week, I got to thinking how this is also really the end of a significant DECADE for me. So I thought I’d reflect and capture a few events of the past ten years, all of which I experienced while living in our current house, which we’ll be moving out of on January 16. Taking the time to review this past decade has been an exercise in thankfulness for me. So many good people have come into my life since 2001, and I’ve been blessed with many wonderful experiences. 2001—I had surgery for CANCER (endometrial) on my 50th birthday, in March, the same month we moved from the house we had built in 2005 into a rental house in Harbor Town. Our youngest child, Beth, graduated from high school in May and left for college in August, so WE BECAME EMPTY NESTERS. ATTACKS on the World Trade Centers and the Pentagon happened in September, and oldest son, Jon, joined the Army that same month. We MOVED again in October, into our current house. 2002—I took my first ICONOGRAPHY WORKSHOP, which kickstarted a brief (8-year) “career” teaching iconography and writing icons as commissioned work. During those years I took workshops in Michigan, California, Washington, D.C., and Mississippi, and taught workshops in Memphis. Stacy Autrey was baptised and became my 12th Godchild, and I served as Matron of Honor in Stacy and Jared’s wedding in July. 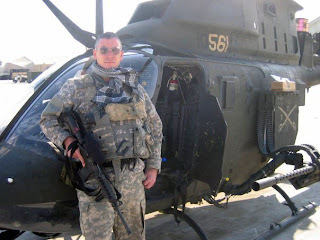 2003—Jon DEPLOYED TO IRAQ where he drove a hummer into Baghdad during the initial surge. My Goddaughter, Katherine Thames, and her family lived with us for 3 months when they returned to Memphis from the mission field in Honduras. Sophie Mansour was born and became my 13th Godchild. 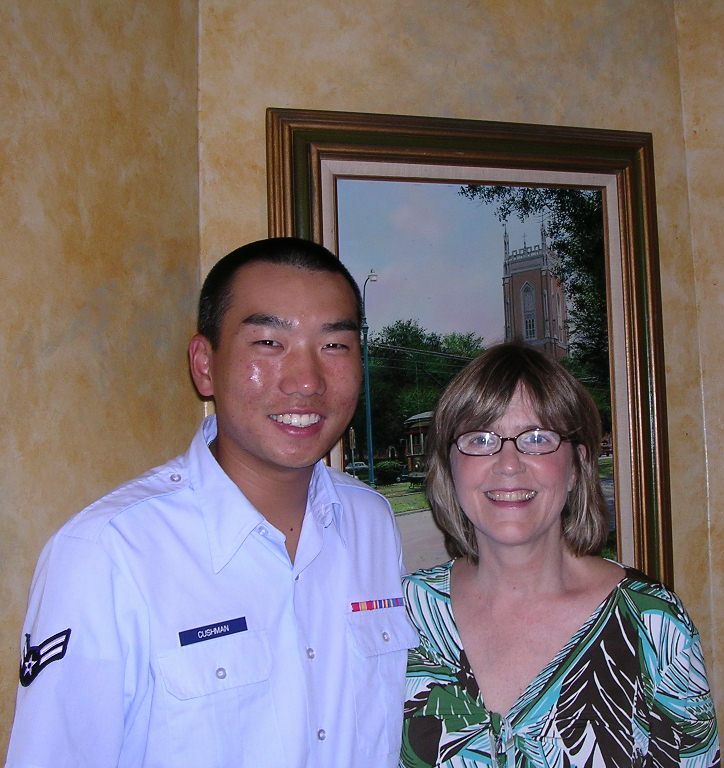 2004— Our younger son, Jason, joined the Air Force. Bill, Beth and I joined 70 other members of my husband’s family for a week-long family reunion cruise to Alaska. (Jon was deployed and Jason was in basic training with the AF, so neither of them could go.) This was one of my favorite travel adventures of all time. 2005—My aunt Barbara Jo died of cancer. (I spent several weeks with her in Hospice care in Mississippi.) Beth graduated from college. 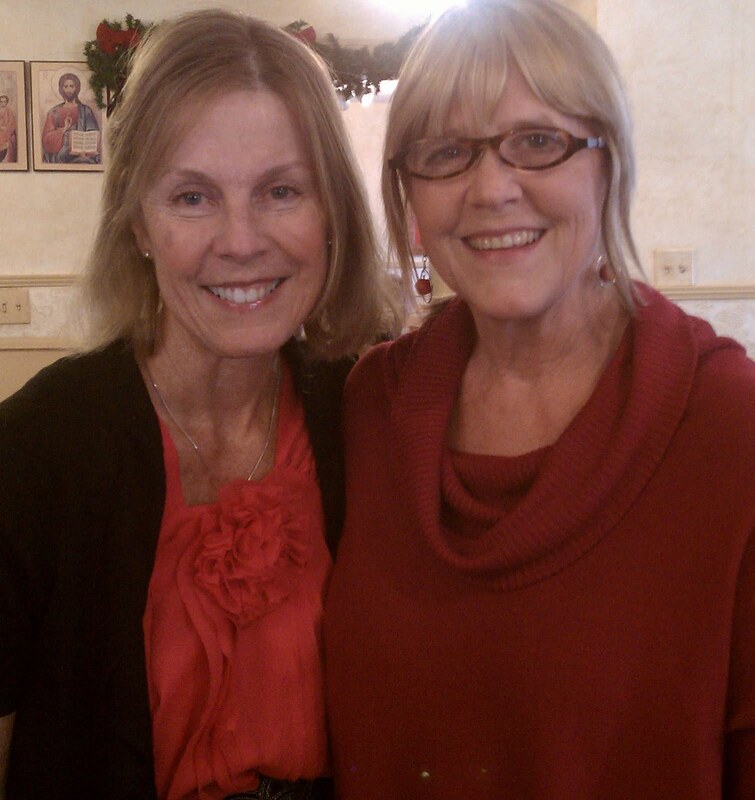 I spoke at a women’s retreat in Austin, Texas. 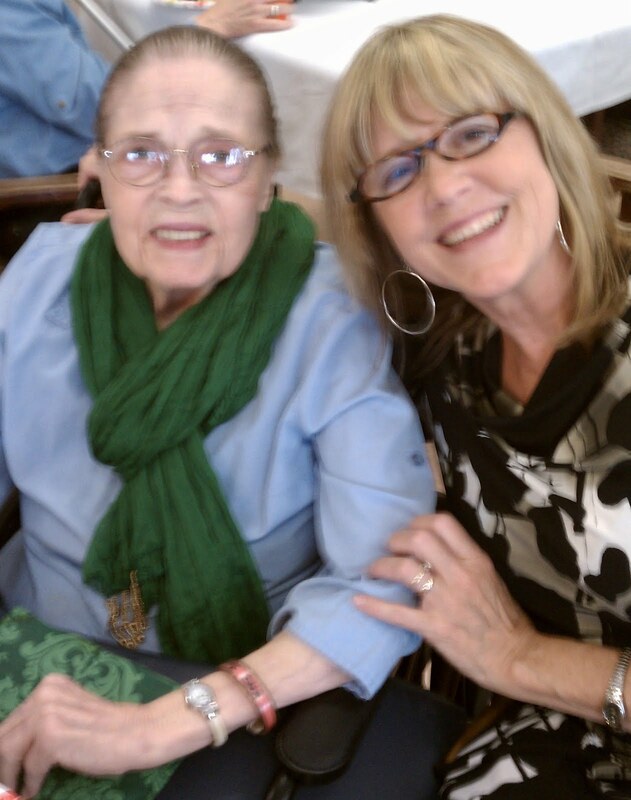 I moved my mother into assisted living and sold her house in Jackson, Mississippi. The weekend that Hurricane Katrina hit Biloxi, I had taken my daughter and my mother to visit Jason, who was at the Biloxi Air Force Base. We drove home on August 28. 2006—I wrote my first novel—The Sweet Carolines—and met several of my literary heroes, including Beth Ann Fennelly, Cassandra King Conroy, Jennifer Horne and Wendy Reed at the Southern Festival of Books, the last year it was in Memphis. (The novel is waiting for possible revisions in the future.) We discovered Seagrove Beach, Florida, where we celebrated Jon’s graduation from flight school before he deployed to Iraq a second time. 2008—Jason married See Vang and moved to Denver (from Cheyenne, Wyoming.) I moved Mother into a nursing home. My dear friend, Sue Brownlow, became Orthodox and asked me to be her sponsor, making her my 14th Godchild. I wrote a second memoir, also not for publication. My essay, “Blocked,” was a finalist in the Santa Fe Writers Project literary competition and was published in their literary journal. I met three of my writing mentors in 2008—Scott Morris and Jere Hoar, who were on faculty for the Yoknapatawpha Summer Writer’s Workshop—and Neil White, who organized the first Oxford Creative Nonfiction Conference, which I attended with Daphne Davenport and Katherine Thames. Kristen Iversen and Dinty Moore led two manuscript critique workshops that I participated in, and they have continued to be mentors and friends. 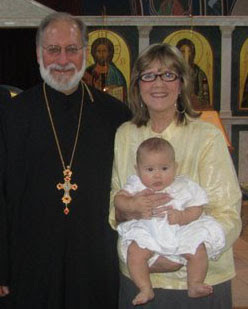 2009—Our first grandchild, Grace, was born. Jon deployed to Afghanistan. Bill and I attended my 40th high school reunion, where I reconnected with several friends that I’m now keeping up with again. 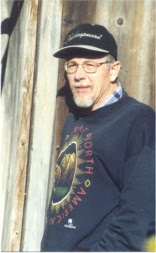 I began work on a novel, and published several more essays. 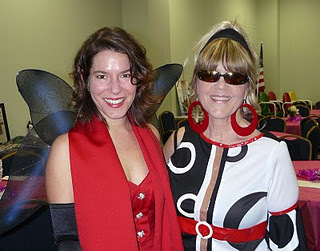 I was a presenter at the Southern Women Writers Conference at Berry College in Rome, Georgia, where I met another close writing buddy, Ellen Ann Fentress, of Jackson, Mississippi! I attended a spiritual writing workshop in Oxford led by another new friend and writing mentor, the Orthodox poet and writer, Scott Cairns. I joined Twitter and Facebook in 2009. 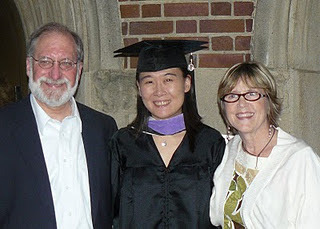 2010—Beth got her Master of Architecture degree and moved to Denver. Our second grandchild, Anna Susan was born. I took another beach trip with my best friend, Daphne, and her kids. Bill and I celebrated our 40th wedding anniversary with a trip to Italy. My beloved 21-year-old cat, Oreo, died. I traveled with Southern author, River Jordan, to Jefferson, Texas for the Pulpwood Queens Girlfriend Weekend, where I met Pat Conroy, Elizabeth Berg and other literary idols and made new friends like Nicole Seitz. I spent my first month-long writing “retreat” at the beach for the month of November. I was co-director of the 2010 Oxford Creative Nonfiction Conference. I continued to write and publish essays. 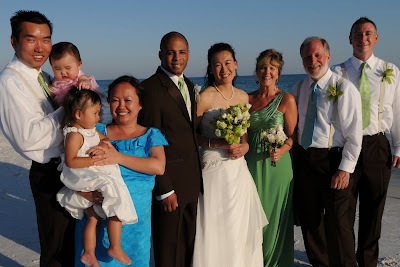 2011—Beth married Kevin Davis at sunset on the beach in Seagrove Beach, Florida. 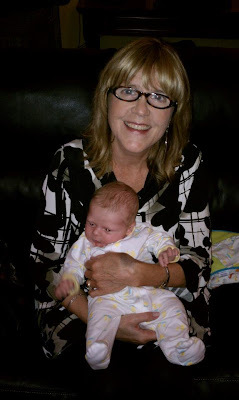 I turned 60 and celebrated 10 years being cancer free! I was a “colonist” at the first Fairhope Writers Colony Retreat in June, led by Sonny Brewer and several other great Fairhope authors. I spoke at the Boulder Writers Workshop in Colorado in August and organized and directed the 2011 Memphis Creative Nonfiction Workshop in September. Jackson Stephen Autrey became my 15th Godchild. My second month-long writing retreat at the beach came in November. Another essay was published, this time in a new literary journal, The Saint Katherine Review. The prologue and first two chapters of my novel-in-progress made the short list in the Faulkner-Wisdom competition. As I say goodbye to 2011, I’m heading to Denver early on Friday morning to spend New Year’s weekend with Jason, See, Grace, Anna Susan, Beth and Kevin. Jon was home for a week and a half for Christmas (and he and Bill joined me in Seagrove Beach for Thanksgiving) so the holidays are full of family for me this year. 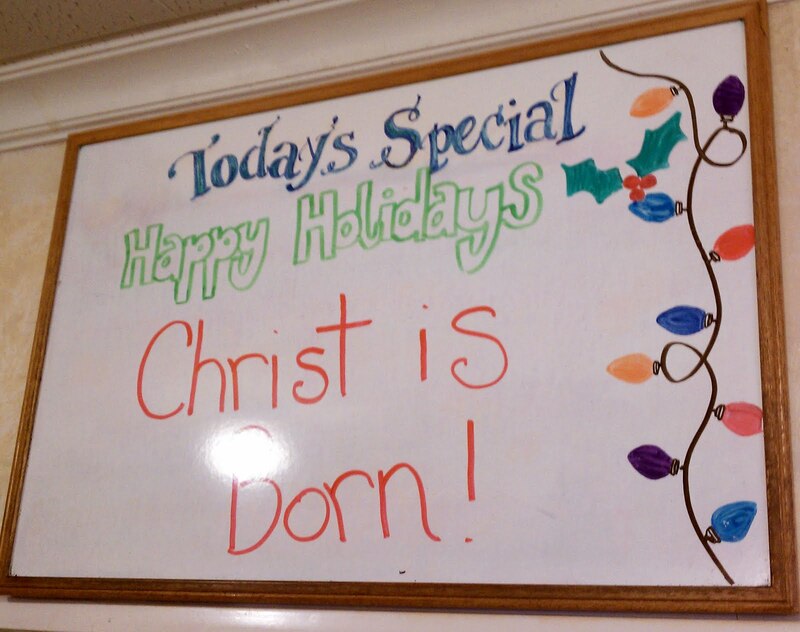 (Including a joyful Christmas party with Mom at Lakeland Nursing Home. )I’m leaving my laptop at home this weekend and looking forward to being off the grid for a few days. I hope your New Year’s weekend is safe and joyous. See you in 2012! 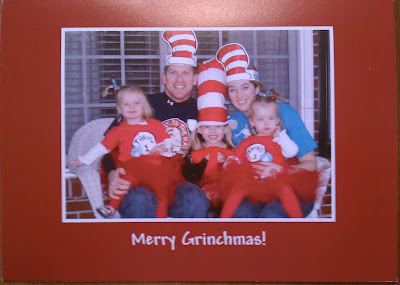 >Last year I did a post about my favorite Christmas cards of 2010. Actually, two posts, including this one, from the Eve of Nativity, 2010. As I looked through the hundred or more cards we’ve received this year, I was not surprised to discover that some of this year’s favorites are from the same folks…. artists and creative young families. And a couple of newcomers made the cut this year. Please understand that I LOVE CHRISTMAS CARDS OF ALL TYPES. I love to send them and receive them. But the artist and writer in me can’t help but notice when a card is especially creative or unusual. This first one, from the McCollums, who lived in Memphis for several years before returning to middle Tennessee, features art work by their ten-year-old daughter, Christine. 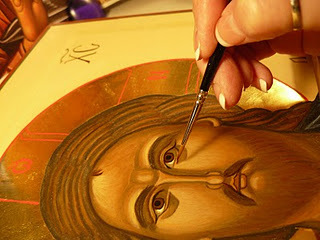 Christine’s mother, Anne Marie, took one of my icon workshops a few years ago, and is a creative woman on many fronts. (She sews, bakes amazing wedding cakes, scrapbooks, paints, and home schools four children.) I see that Christine is also a budding iconographer/artist! 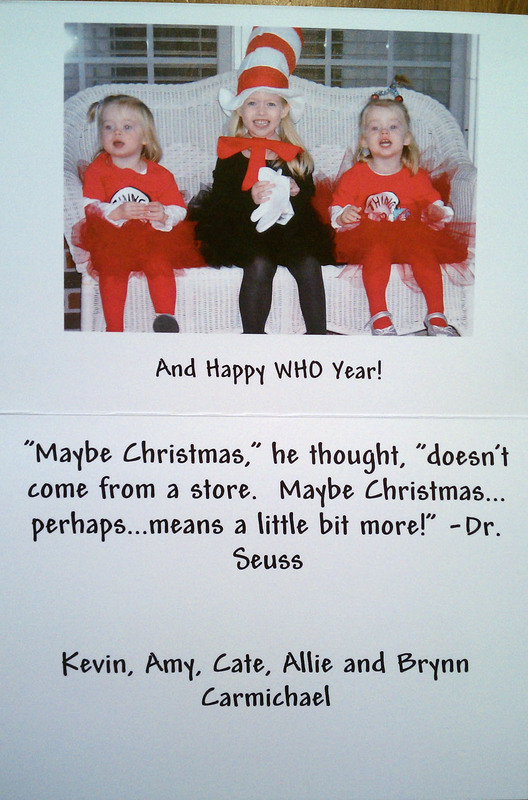 Sarah and Joel Finley’s card was also among the favorites last year. Again, no surprise here, as Sarah is also an artist/iconographer, school teacher, and musician, along with her husband Joel and others in the Nashville band, Lulu Mae. 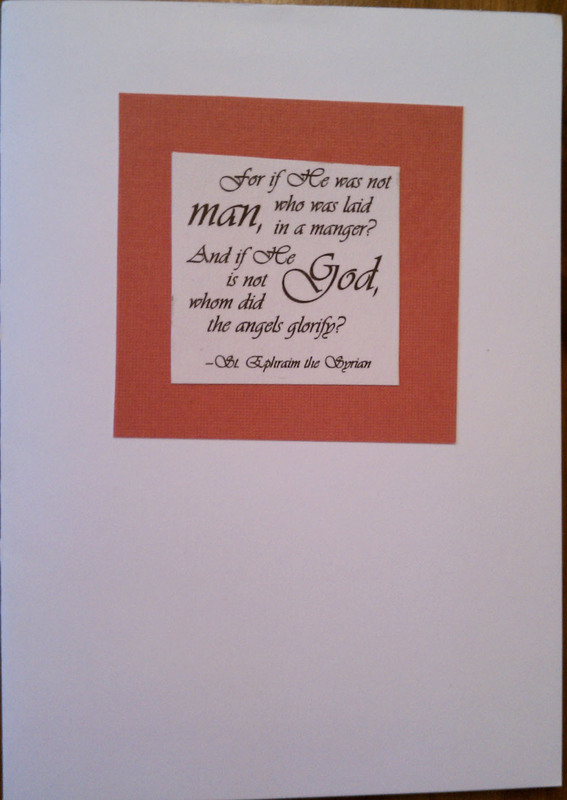 The photo doesn’t do justice to the card, which is multi-layered and features a wonderful quote from St. Ephraim the Syrian, also a poet. Interestingly enough, the Finleys also live in the Nashville area. Lots of creative juices flowing over there! And another repeat favorite, from our friends and neighbors, Bob Layman and Barry Cantrell. Bob and Barry work with iron to create wonderful pieces of art, and they also do terrific house renovations (like ours). 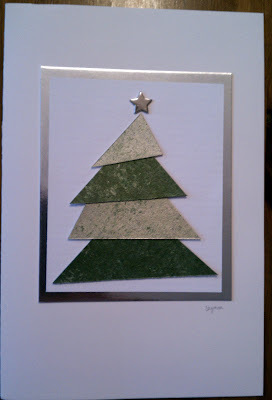 This card is beautifully layered with interesting pieces of shiny paper and the star is also 3-D. The photo doesn’t really show how wonderful it is, but I loved the composition. Bob and Barry will also be helping us transition to our rental house in Harbor in a few weeks by painting several rooms for us before we move in. Their creativity and their friendship are blessings to me. 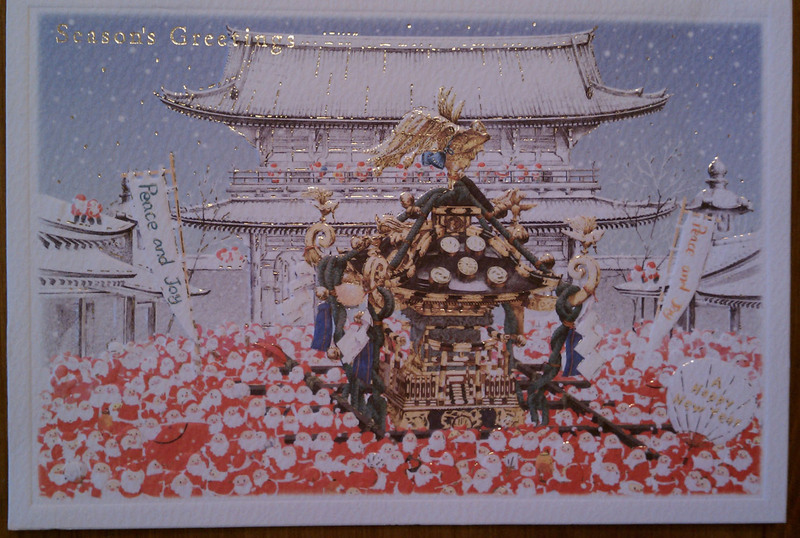 Maybe our most unusual card, and definitely the one that traveled the farthest to reach us, is this lovely image sent by Dr. Yoshihiro Kokubo, Chief, Department of Preventive Cardiology at the National Cebrebral and Cardiovascular Center in Osaka, Japan. A few weeks ago my husband traveled to Kyoto to speak at a medical conference, and Dr. Kokubo was one of his hosts. I think it’s interesting that the card company put the text in English. 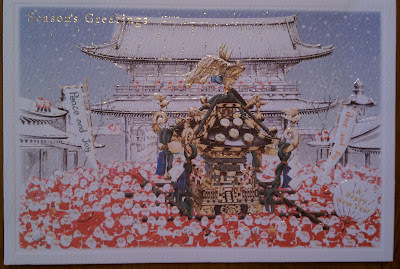 The beauty of the card is a reflection of the beauty of the people my husband met while he was there. My final two favorites are photo cards. 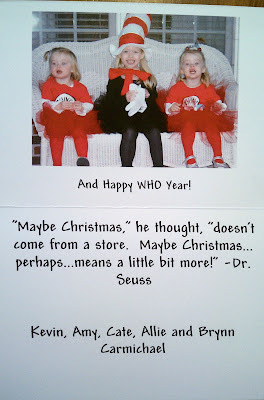 We sent a photo card this year, and I noticed that about 90% of the cards we received are photo cards. And while I love sending and receiving pictures, I decided that next year I’m going to try to send a more traditional card… or create something original. I must say, however, that these two photo cards are also very creative. 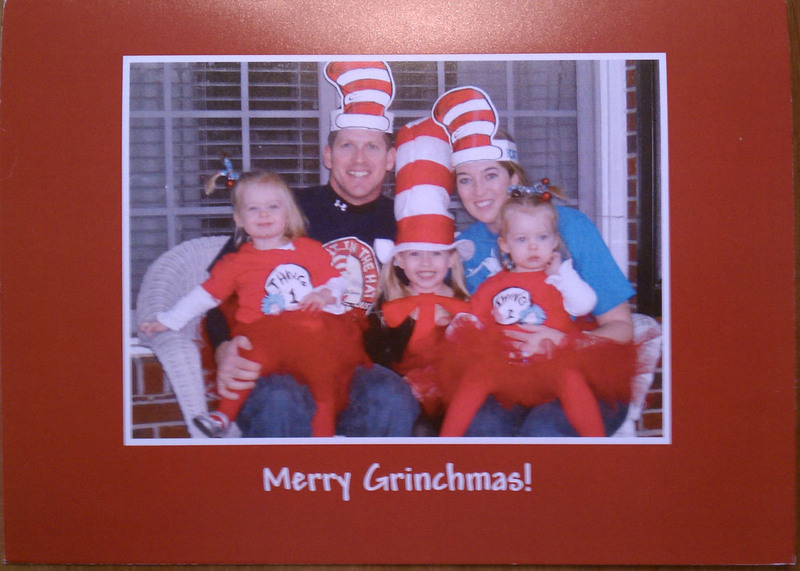 This first one is from our niece and nephew in Atlanta, with their three little girls. The Dr. Seuss theme is precious, isn’t it? The oldest, Cate, is about 5 now, and younger sisters, Allie and Brynn, were premature twins who had to stay in the hospital for a few months when they were born, three years ago. 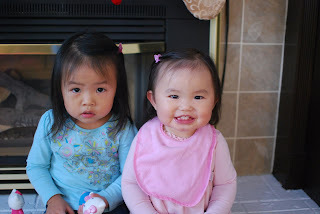 We were all so thankful for their growth and health, and seeing them at age 3 is such a joy! 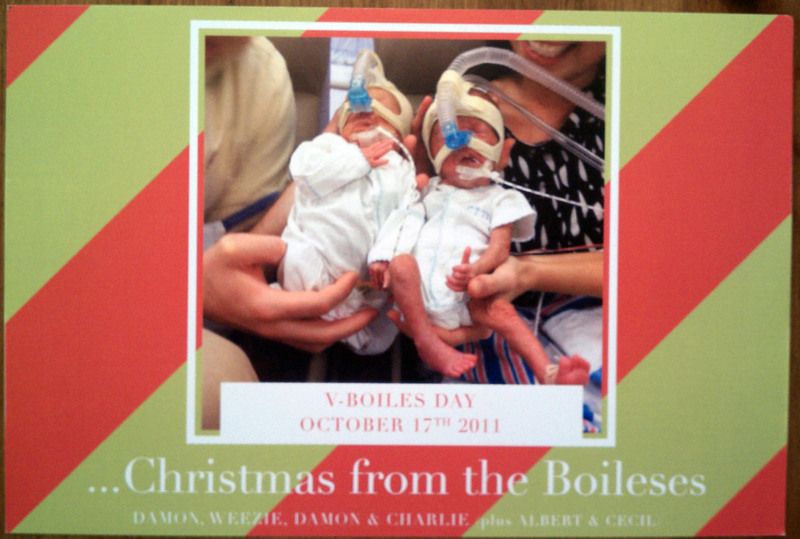 I’ll close with another photo card, also from a precious couple who had premature twins recently. Damon Boiles III, our Godson and his precious wife, Weezie, live in Birmingham. 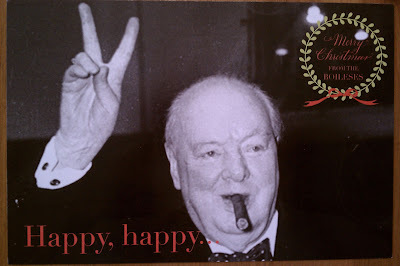 I love the front of the card… which gains meaning as you turn it over…. and see V-Boiles Day! 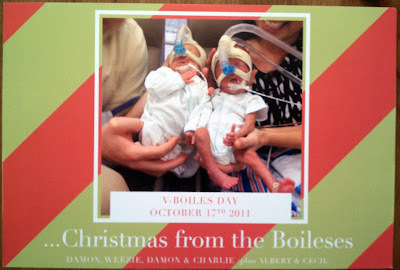 Damon IV and Charlie were born on October 17th, and they are still in the NICU in Birmingham, but since this photo they’ve been able to sleep in real cribs and breathe without the big breathing devices, and their folks have even been able to begin to feed them with bottles. Victory for the Boileses, indeed! 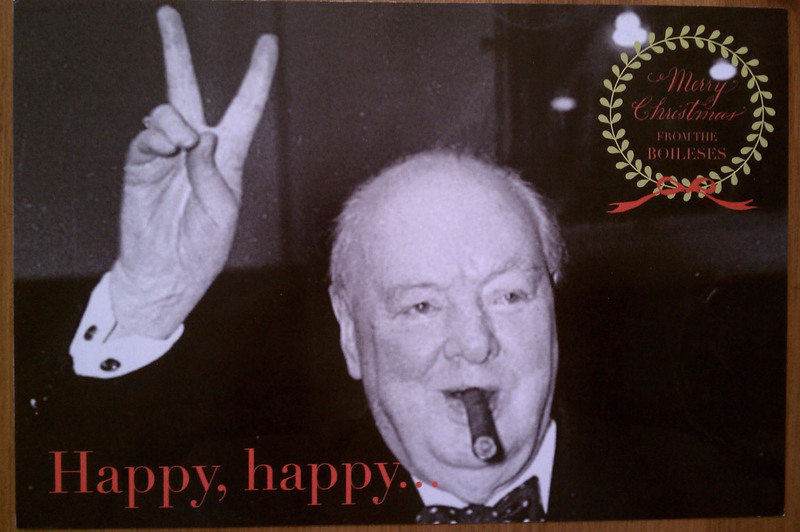 Thanks to everyone who took the time to send us a Christmas card this year. They are all “winners” and each one brought us great joy. I always leave them out until Epiphany (January 6) so I can sit and look through them again, taking time to read the Christmas letters slowly after the busy days of Christmas are over. I hope you enjoyed my little gallery! > “Kathy” (not her real name) has two college degrees, seven years of service as a photographer with the United States Navy and a second career as a teacher for the Memphis City Schools. She just turned 60, and quit teaching last year due to being in an overwhelmingly difficult work environment. Now she lives in her car. There were quite a few veterans there, and some of them, like Kathy, didn’t know how to get the services they need from the VA until Father Basil (who is also Chief of Preventive Medicine at the VA in Memphis) shared some information with them today. He plans to get together with Kathy next week to help her get connected with the right folks at Veterans Affairs. It was obvious that we were supposed to be there today, for so many reasons. I loved meeting Tony (his real name) who is an artist who teaches classes at Jacob’s Ladder. Here’s Tony with this amazing painting. He uses fabric paint. 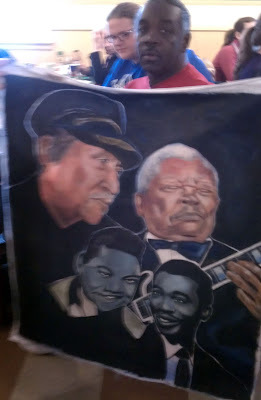 He has recently been asked to paint legendary Memphis soul musician J. Blackfoot, who died on November 30. The painting will hang in the Stax Museum here in Memphis. 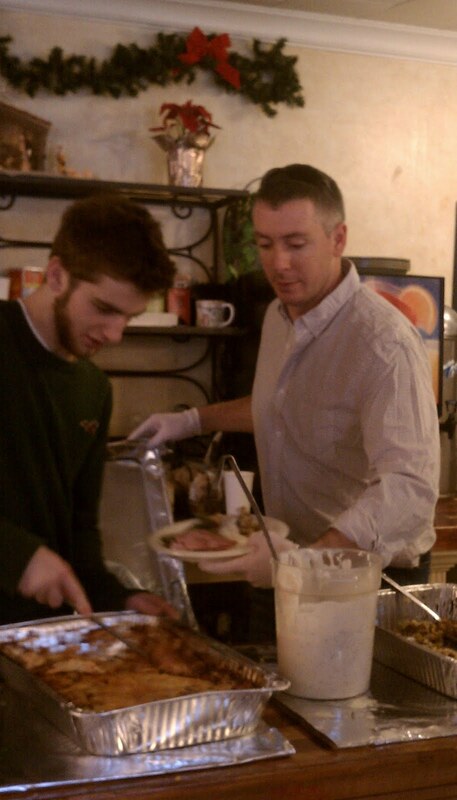 Christmas Dinner at Brother Junipers’ isn’t your usual “feed the homeless” affair. 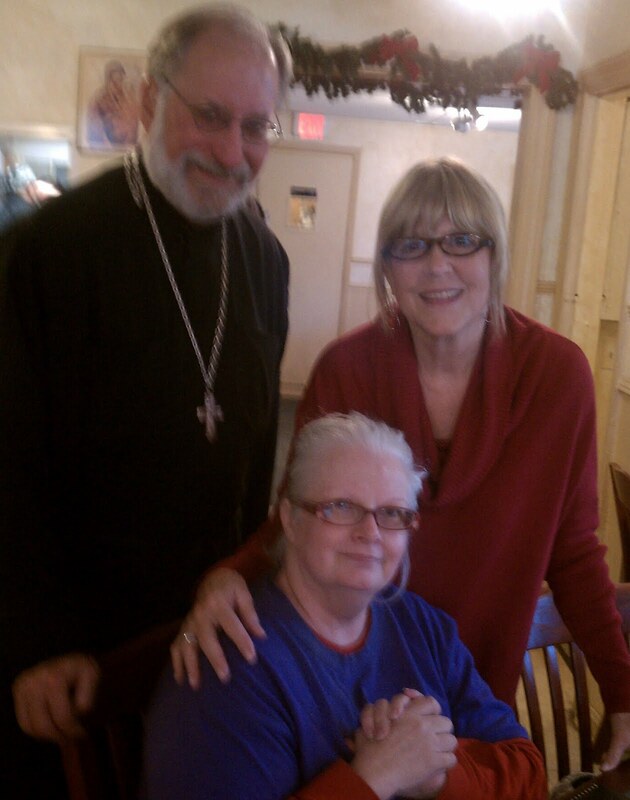 It brings together neighbors, restaurant regulars, and those in need with “accidental tourists” like the family who was driving through Memphis and Googled restaurants and just happened to choose Brother Juniper’s for their Christmas meal. They had no idea until they arrived that the meal was free! 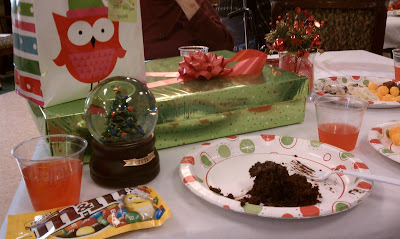 The table of folks next to us broke out in spontaneous song at one point, and we all joined them with a few Christmas carols. Did I mention how good the food was? Turkey, dressing, fresh sautéed green beans, sweet potato casserole, lasagna, deserts, and even kahlua and Baileys for the coffee! 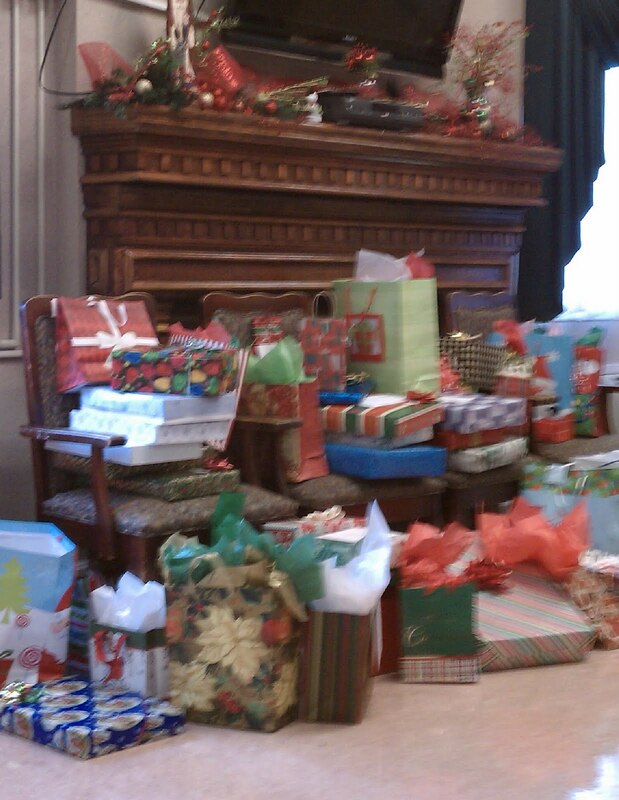 The Koplins did some of the cooking, and sponsors and volunteers contributed the rest. As we visited with some of the couple of hundred guests who came and went from 11 a.m. to 1:30 p.m. today, I found myself often on the brink of tears, and so thankful for this special treat that we were given today. As “Santa Clause” gave out candy canes, some of the children were equally as interested in the large cross that hung around my husband’s neck. And when someone told Tony that I was an artist and he asked what I paint, I only had to point to one of the icons hanging on the wall near the restaurant’s kitchen door. Yes, this will be a Christmas dinner to remember, and one I hope we can participate in again. Thanks, Jonathan, Pauline, Sarah, Patrick, sponsors, volunteers and guests for THE BEST CHRISTMAS DINNER EVER! 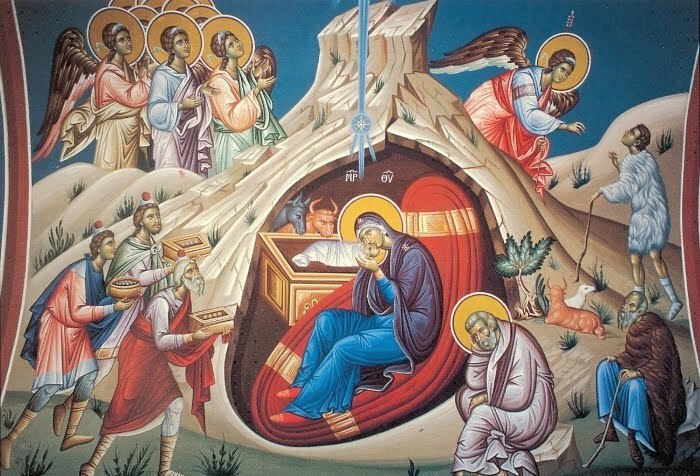 >In considering what gift I might offer to my readers this Christmas, I immediately thought of this wonderful ekphrastic poem, “Nativity,” by my friend, Scott Cairns. It’s actually the first of two parts of his poem, “Two Icons,” which is published in his wonderful book, The Compass of Affection. Two years ago I did a post about Cairns and a spiritual writing workshop he led in Oxford in 2009, which I was blessed to attend. Since the poem is ekphrastic, I’m including an icon of the Nativity here as well. 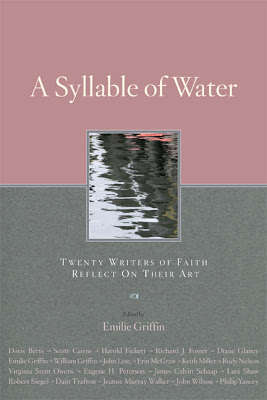 There are many excellent ones, but this one has most of the elements Cairns reflects upon in his poem. 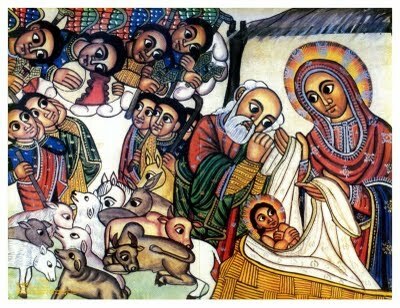 (It’s missing the wise men’s horses and the dog near Joseph, but you can use your imagination.) If you look at the icon for a few minutes first—prayerfully—and then read the poem aloud, slowly, letting the words fill your soul, it’s possible that the image and the words will open for you a window to Heaven. she holds, beholds, reclines beholden to. receive that creatured air, and pray. © Scott Cairns. Used with permission. P.S. 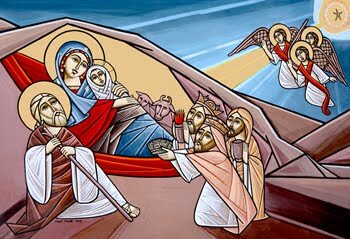 I really love Coptic icons, so I’m including several below for your enjoyment. 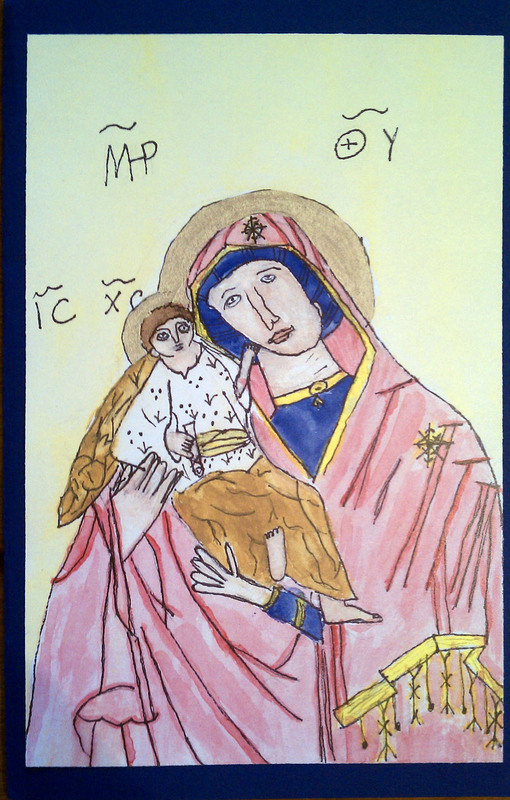 And… I just found this short video of Coptic icons being written in the UK. I’m not usually a fan of contemporary Christian music, but I love the song in this video. I think I’ve posted this every Christmas for the past three years, but this is my favorite Christmas video. Actually two of them – one’s the studio version. 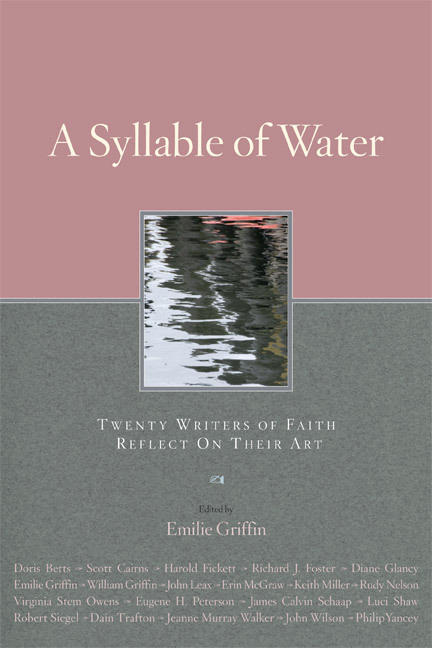 > I’ve been reading a wonderful book which is actually a collection of essays: A Syllable of Water: Twenty Writers of Faith Reflect on Their Art, edited by Emily Griffin. Before you say, “Oh, no, another essay on ‘place’” you might want to know that Leax isn’t talking here as much about the sense of place that literature evokes as the place the author needs in order to create art. I’ve been looking for that place for many years. My longing for a place to write is what takes me to Seagrove Beach, Florida, every November for a month of solitary writing. And it’s what’s been driving me to find a different house in a place that feeds my soul. 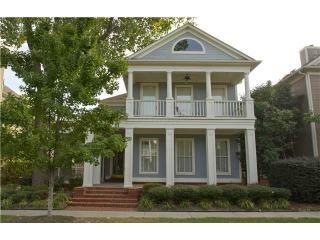 (We’re moving 4 weeks from today to this house in Harbor Town, on the Mississippi River, where I can see sunsets from our porch or stroll a couple of blocks to the river’s edge.) And in that house, my husband will have his “man den” (complete with desk, computer, printer, flat screen TV, leather chair, and filing cabinets) and I will finally have A ROOM OF MY OWN. 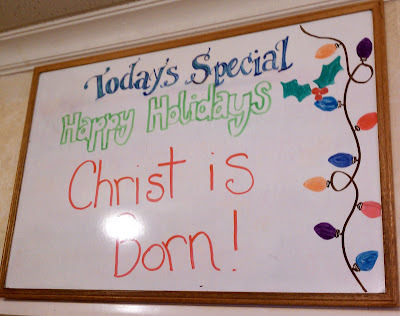 > On Thursday I went to the annual Christmas party at Lakeland Nursing Home in Jackson, Mississippi, where my mother has been a resident for three years. “No I’ve had it for years.” She fingered the gold beads on its edges. Then I saw another resident wearing one just like it and I asked her where she got it. She pointed to a young woman standing near one of the doors and said, “She gave them to me and to your mom.” So I introduced myself to the woman and learned that she comes to Lakeland every week or so and just gives gifts and visits with residents. She said my mother is always smiling and chatty and she loves to visit with her. What a gift to know this. Residents’ families had sent “Santa Gifts” to be given out by a visiting Santa during the party. Mom kept asking me over and over “who sent these things?” When I put the blingy bracelet on her arm and said, “Merry Christmas,” she said, “Well, let’s put this away until Christmas.” And I would say, “No, Mom, this is to wear and enjoy now!” Same thing when she opened my gift, two blouses with matching slacks. She did have an opinion about the blouses, though, saying, “I like that one better,” pointing to the peach flowered top and khaki slacks. 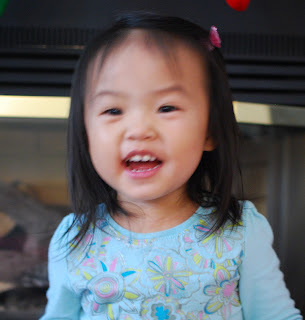 And she loved the snow globe that played, “Deck the Halls,” while snow came down on a little Christmas tree. And she ate most of 3 pieces of cake (she’s a picky eater!) because she could see the chocolate one, the coconut cake, and the white cake with Christmas icing, and she wanted to have some of each. 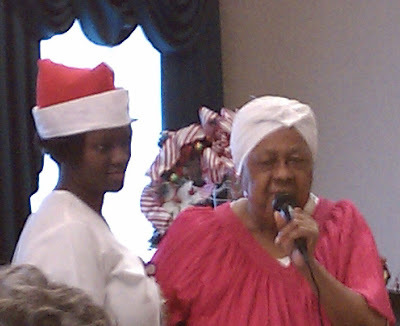 After some Christmas carols, this woman, Hattie, who is a resident at Lakeland, stood up and recited a poem she says she learned in Sunday School fifty years ago. It was lengthy and included singing a few lines in the middle, beautifully telling the story of Christ’s birth and bringing me to tears. After the party I went with Mom to her room to put away her new clothes, and she said, “It feels small in here.” So I rolled here back into the hall and parked her next to the woman with the matching scarf and kissed her goodbye. This is always the hard part of my visits. And then the woman smiled and winked at me. Angels everywhere. 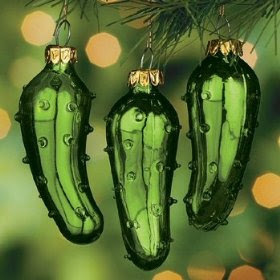 Merry Christmas, Mom. Best family event: My daughter’s wedding at Seagrove Beach, FL (May) Photo shows our whole family together at the wedding: Jason, See, and their daughters, Grace and Anna, Kevin and Beth, me, Bill, and our oldest son Jonathan. Best news: Our daughter, Beth, is having a baby girl next April! Best series I can’t quit watching over and over: Law & Order SVU (Special Victims Unit). Best live musical performance: Jennifer Nettles and Ronnie Dunn at the ACM Girls Night Out (Ronnie sang Jennifer’s “Stay,” and then Ronnie and Jennifer sang “Let Him Fly”—my two favorite country singers together! 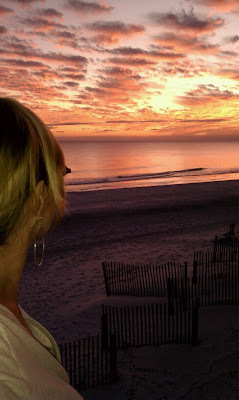 Best writing retreat: the month of November (Seagrove Beach, FL) where I almost finished my novel…. What are your “bests” from 2011? 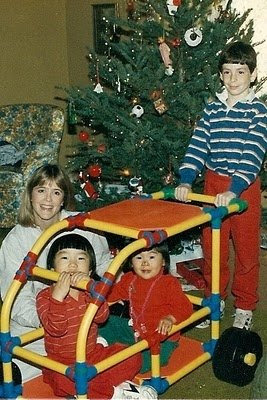 As Christmas approaches, my mind is flooded with memories… of my own childhood, and also the many Christmases with our children, who are now 29, 30 and 34. My favorite Christmas toy as a child would probably not be allowed on the market today because of how dangerous it was. My brother, Mike, and I got it when we were about 8 and 10, back around 1959 or so. It was a “ride” you sat in, tucked your legs up under the seat, and held onto the handles and started rocking until you would spin around and around, completely upside down, over and over. It might have been safe enough, except that after we got bored with it, we became more creative. 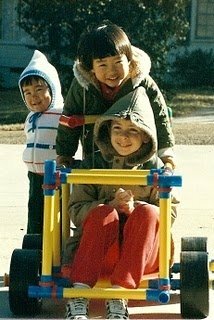 Mike created a contest where we would run from 10 feet away and jump into the seat without stopping to start our spin, thinking we could go faster that way. After he missed once and chipped his front tooth on the driveway, that put an end to the game. 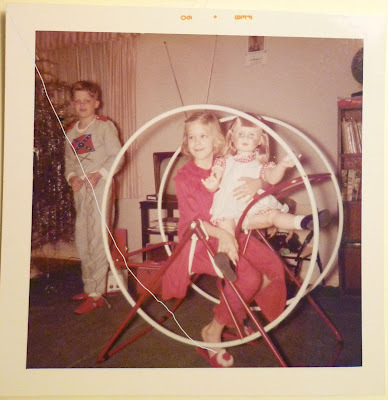 Later we took the circular part off its stand and tried to ride it down the street… and eventually down a hill. 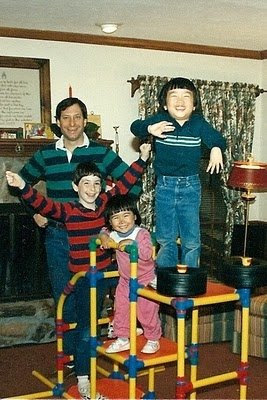 It’s amazing that Mike and I lived through our childhood. When our children were 3, 4 and 7, we discovered Omagles. Back in 1985 a full set only cost about $100. I don’t remember our three kids playing with anything as long as they did with Omagles. Over the years they built everything from lemonade stands to go-carts out of the PVC pipe set with wheels. Ah… the days before computer games! 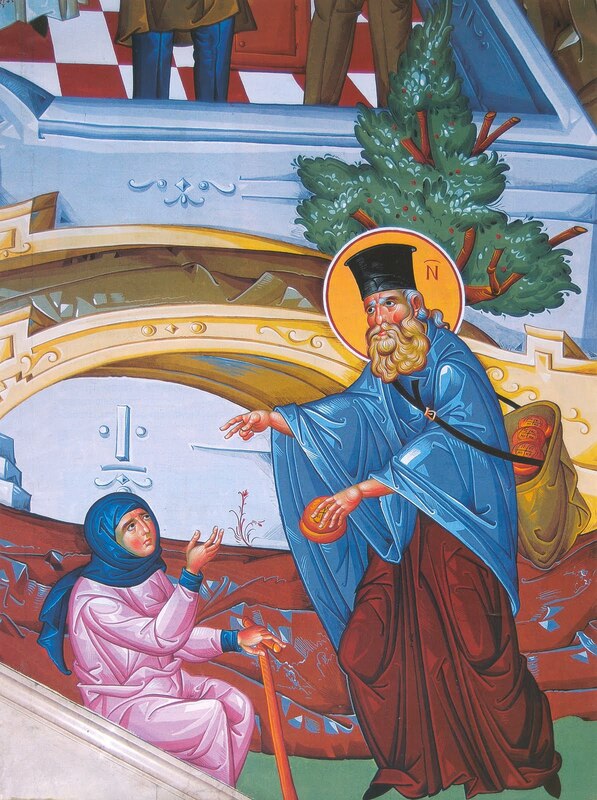 > Today is the Feast Day of Saint Nicholas, Bishop of Myra. I woke up early to say prayers, and to continue working on finding a place to live (we sold our house this weekend and have to move in 6 weeks! ), cleaning out, selling things on Craigslist, taking items to Goodwill, etc. It saddens me a bit that I won’t have time this year to decorate the house for Christmas and do as many festive activities as I’ve done in the past. But it brings me joy to pass on traditions as we move into another phase of life. Yesterday I packed up my Christmas china that I’ve used for about 35 years and shipped it to my son and daughter-in-law in Denver to use as their young family establishes their own traditions. If you’re interested in some serious reading about Saint Nicholas, the most extensive blog I’ve found on lives of saints includes this post from 2008. When I was writing icons, I never did one of Saint Nicholas, but my friend, Sharon Meadows, wrote this beautiful icon of the saint during an icon workshop I led in 2006. Holy Saint Nicholas, pray to God for us!